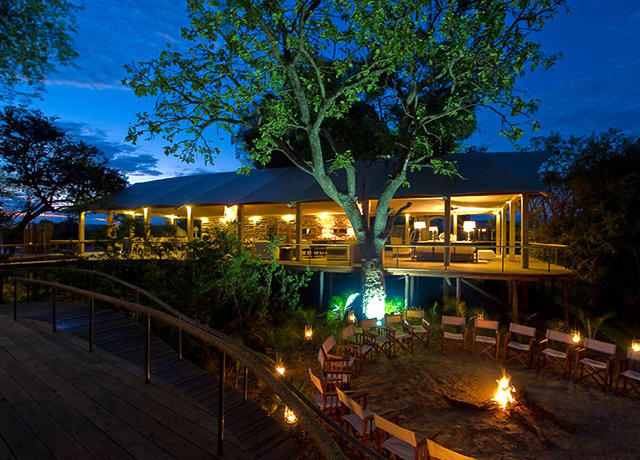 Luxurious Toka Leya Camp enjoys a prime location overlooking the Zambezi River. The east side of the camp is shaded beneath a canopy of trees, while the west side enjoys an open setting next to an ancient baobab tree. Wildlife around the camp includes elephants and crocodiles along the riverbanks and islands, and plenty of resident hippo that often create a ruckus nearby. A wide variety of birds are also on display. The camp's 12 tents are raised on stilts and connected by wooden walkways to the main common area, minimizing the footprint on the land. Tent interiors utilize earthy hues in harmony with the natural environs. All have private shaded wooden decks with expansive views over the Zambezi’s braided channels. Each tent has individual climate control settings to ensure a cool summer sanctuary. Gauzy mosquito nets are draped over poster beds, and spacious en suite bathrooms have double-basin vanities and large showers. The camp’s shared central area incorporates a lounge with plush sofas and reading lamps, a bar, and a canvas-sheltered dining area complete with traditional pizza oven. A swimming pool is surrounded by a large wooden sun deck with lounge chairs overlooking the river. Activities in the area include a Victoria Falls tour, sunset cruises, and guided nature walks and game drives in Mosi-Oa-Tunya National Park, home to Cape buffalo, giraffe, zebra, wildebeest, impala and more. A special highlight includes the possibility of spotting a white rhinoceros in the park. Guests can also explore the town of Livingstone and its museums, and a nearby village. A visit to the village offers a chance to see how local people live, with insights into their culture and traditions. Other activities available at an additional charge include helicopter flights, canoeing, jet boating and whitewater rafting.